The Busiest Girl In The World??? That’s me, I guess. Always busy me! I work in a call center industry which makes me work at nights. So basically, my day begins in the afternoons or evenings. Most of the weekdays, as soon as I wake up, I usually tend to my Church obligations (meet up with Church mates, visit other brethren, join the Bible study sessions, etc.). After that, I go to work which is a 9-hour shift. I’m just lucky that my work environment is not too stressful as compared to the other companies I used to work with. When I come home in the morning, I had to log on to the internet to finish my online chores. But sometimes, ones I’m online, I get distracted and end up wasting my time browsing through social networking sites and other websites. That’s one of the many reasons why I couldn’t blog regularly. The “other reasons” are: just being plainly lazy and do other stuffs like watching my favorite T.V. shows or movies on HBO, sing songs and play my guitar, or eat a lot. There are days that I’m too sleepy; I hit the sack right away as soon as I come home. Those are the reasons why I’m not able to accomplish more important things. Worst is, I end up doing everything in the last minute! I hate rushing things but who can I blame? So in order for me to be productive, I came up with a better idea. I actually started doing this the other day and it worked! It’s simple! I had to create a “to-do list” before coming home from work. 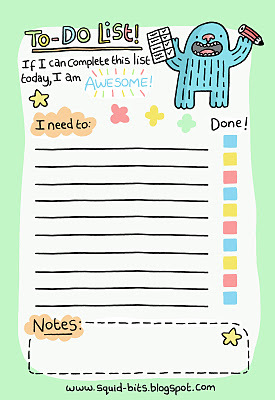 I write down all the important things I need to accomplish within the day and make sure to do them. That means, no more distractions and strictly follow whatever I have written on a piece of paper. J I just hope and pray I’d be consistent this time. So help me, God.